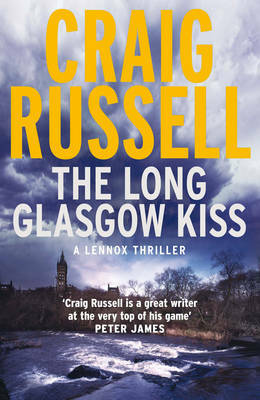 This is the second in Craig Russell's series starring the charismatic, Canadian-born, private investigator Lennox, who operates in the shady area between both sides of the law and has interesting friends in high places. It is set in post WWII Glasgow, before drugs had started to take their hold over the city, and when the country was still very much in recovery mode after the long years of war. Lennox has seen active service: the reason he now finds himself in Bonnie Scotland, and often ponders his actions during the fighting that have made him into the battle-scarred person he is today. The book opens with the untimely demise of one of Glasgow's less than savoury characters, "Small Change" MacFarlane, who has been beaten to death in his home. This is unfortunate for Lennox, who is currently dating MacFarlane's daughter, and he is drawn into the case and is soon up to his eyeballs in trouble trying to find the person responsible. Doubly unfortunate is the fact that his intentionally casual relationship looks as if it might have some responsibilities attached to it after all, since MacFarlane's daughter is inconsolable and turns to Lennox for comfort. Not what he had in mind at all. Hot on the heels of this investigation, Lennox is contacted by Sheila Gainsborough, a gifted and popular local-lass-done-good singer, who is currently achieving a significant amount of fame for her talents. Her brother has recently gone missing and she wants Lennox to find him. She also wants the situation to be kept quiet and does not want the police involved. Lennox soon finds himself in deep water and face-to-face with John Largo, a new tough guy in town who poses a threat to even Glasgow's toughest "Untouchables" - The Three Kings. THE LONG GLASGOW KISS is a superbly dark and suspense-ridden book. It cleverly mixes just enough of Lennox's inner thoughts and actions to keep your interest piqued and attention focused. Lennox is a true tough-nut and a great character to boot. The war has ravaged him enough to give him a hard edge that enables him to survive in Glasgow's underworld, but he is sensitive enough to be interested in people and want the best for his friends. Lennox is a fascinating new character for me to get to know and a new favourite for my ever-growing list.